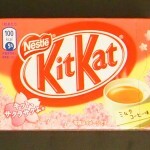 Review: Kit Kat Milk Coffee | Oyatsu Break! 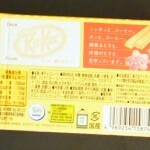 ← News: Get Out The Vote for Japanese Kit Kats! I don’t know if it’s apparent, but I try to do some research on all of the snacks I review here at Oyatsu Break! One of the things that I haven’t mentioned yet here, is that Kit Kats have a novelty value to their name that presages some of their popularity. 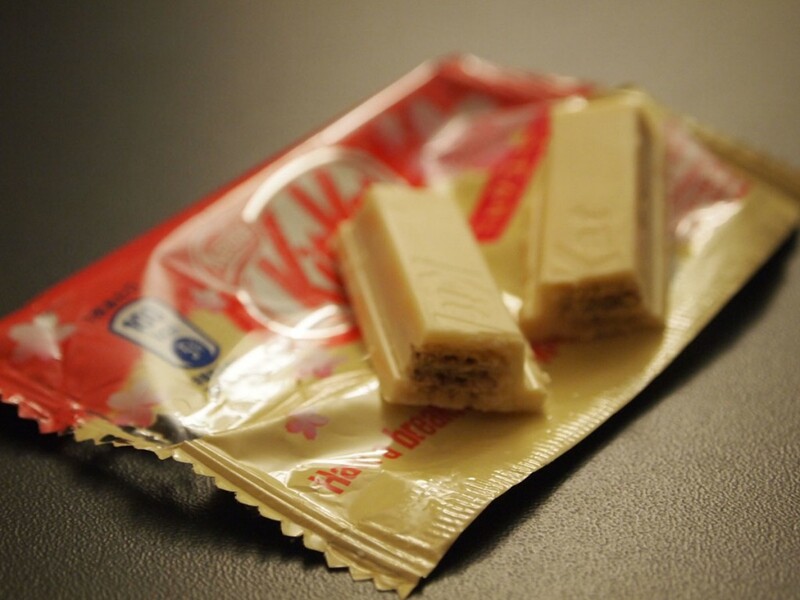 “Kit Kats” is usually pronounced in Japanese as “Kitto Katsu”, which in Japanese means “You’ll win for sure!” or “You’ll pass for sure!” It’s an auspicious phrase said to students when they’re studying for exams, or when someone is undertaking a challenge. Further to that, the phrase “sakura saku” means “Cherry Blossoms Bloom,” which also has connotations of success and good fortune. 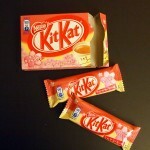 Which brings us to this new flavour, Kit Kat Milk Coffee. 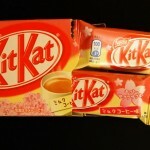 Packaging: Decorated with sakura, I had initially thought that this flavour of Kit Kat was some sort of cherry-blossom infused tea, a black tea rather than a green tea due to the colour of the liquid in the cup on the packaging. This is the danger and the fun of trying Japanese snacks without being able to read the labels–and this particular item has no English description of the contents. In reality, the Sakura that dot the packaging are symbolic for blossoming success, the name Kit Kat a “you can do it!” message, and the flavour–Milk Coffee–is probably what a lot of students are drinking by the bucketful as they try to stay awake to study. The packaging even features the phrase “Sakura, Saku yo” on it, and a space on the back to write a message of encouragement. And because this is Japan and they generally have awesome packaging, the area that you write on has a matte finish rather than the glossy finish on the rest of the box, to make your task easier. Genius! I want to be grumpy about the lack of English on the package making it difficult to understand for foreigners, but working to discover things like this about the culture is why I’m so interested, why I do a blog, and so I won’t knock any ‘points’ off on the design front. 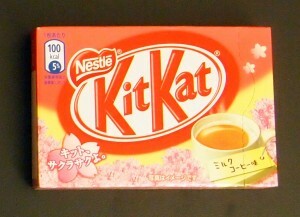 This is very clearly a “by the Japanese, for the Japanese” iteration of the candy. 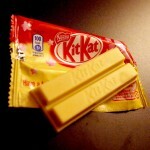 Scent: It’s a white chocolate Kit Kat, and so quite honestly the biggest scent is the white chocolate coating. There’s a faint smell of coffee if you really work for it, but overall the scent of these Kit Kats is very mild, and not terribly exciting. Maybe they should have added some sakura to this one, if only for the aroma…! 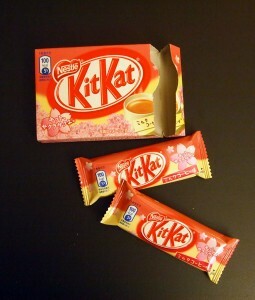 Taste and Texture: I find that the white chocolate Kit Kats tend to melt quicker than the milk chocolate ones, and so this was a bit messier than I was expecting despite it being only 20 degrees in the room. 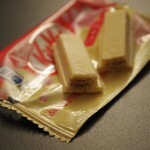 The immediate taste was the white chocolate coating, which didn’t have much in the way, but after the first bite the scent and taste of another familiar chocolate bar filled my mouth–Coffee Crisp. It tastes very much like Coffee Crisp actually–a touch sweeter, a touch less chocolatey, but the resemblance is pretty uncanny. For those of you who’ve never had a Coffee Crisp before, it’s a coffee-infused chocolate bar, heavy on mocha and wafer tastes. 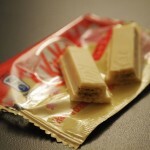 The wafer taste on the Milk Coffee Kit Kat is very strong, as is the mocha and surprisingly a bit of milk chocolate–despite the fact there isn’t any milk chocolate in it as far as I can tell! A quick taste of the outside white chocolate confirms it’s the ordinary flavour, which means the mocha is coming entirely from a cream sandwiched between the wafers. I guess the white chocolate is supposed to account for the “milk” part, and the coffee from the wafers, but honestly it didn’t taste tooo milky. It’s a really great flavour combination though, and while I just try to stick to one or two fingers for these taste tests, I surprised myself by opening up the other two-finger package to ‘try’ a little more. And now I kinda want a Coffee Crisp. Verdict: I brought my husband in to try some to see if the resemblance to Coffee Crisp was all in my head, but he agreed that it was very similar. “Knowing what it tastes like, I’d definitely eat it again,” he said. “It’s a solid second-tier choice for a candy bar, when you want a specific flavour that’s well-executed.” I completely agree, and maybe feel a little more strongly than that. Shame it’s only a limited-time flavour! I’d like to thank the good folks at http://ponkanchan.blogspot.com/, specifically this post, for being my primary research spot on this review. Arigatougozaimasu!